Shentons have again this year entered a relay team of four, running from Salisbury to Winchester. This is to raise funds for their charity ‘Solent Mind'. The all-girl team are: Alex Chessum, Chloe Jay, Lisa Warriner and Gwyneth McLaughlin. They are led, coached, driven and captained, by their senior partner Shaun Underhill. Chloe comes from Petersfield and runs with the superbly named ‘Runny Honeys' completing her first half-marathon this year. Lisa and Gwyneth are keen Overton Harriers and excited to be leading the team out for the first half of the race. 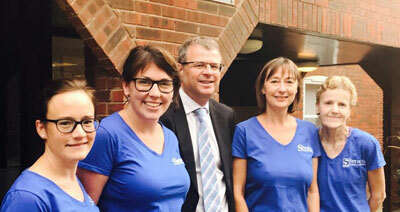 Shentons have submitted a running team at the Clarendon for most of the last decade with their love for the challenge coming from their previous senior partner Nick Bell who is a member of Winchester Rotary and supports the race every year. ‘Solent Mind' is a registered charity providing a wide range of high quality services to support people with mental health problems across Hampshire. The charity works across all age groups, with diverse communities, with individuals and groups. All this helps to make a difference for people with mental health issues. As solicitors, the team at Shentons frequently work with people at the most stressful time in their lives and this can often coincide with a deterioration in their mental health. The team are very keen to give this charity their full support. If you would like to contribute to their charity please visit their just giving page.